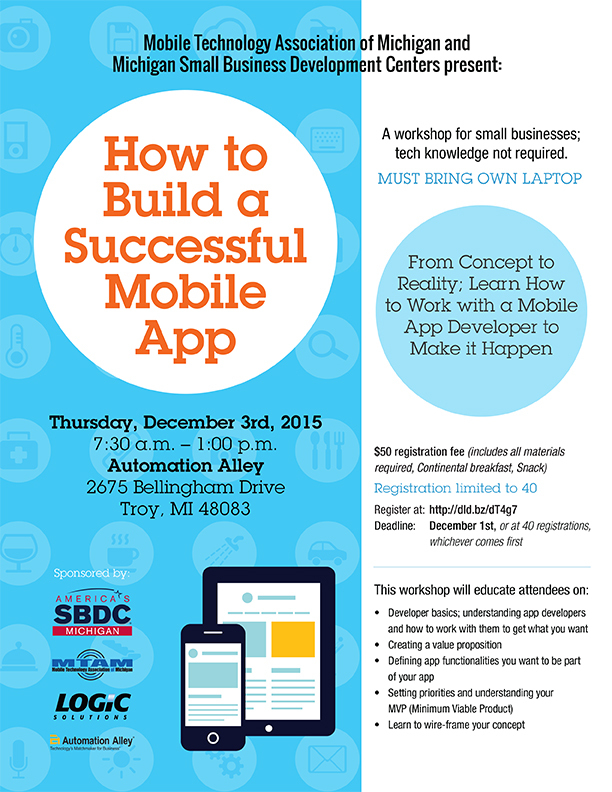 ANN ARBOR, MI – Logic Solutions co-host the “How to Build a Successful Mobile App Bootcamp” workshop on Thursday, December 3, 2015 at Automation Alley in Troy, MI. The event is targeted toward small businesses with an interest in learning how to work with a mobile developer on how to bring their mobile app ideas from concept to reality. Logic Solutions’ Chief Technology Officer Matt Sarkesian, Director of Innovation Angela Kujava, and Business Development Manager Al Carpinelli will teach attendees about developer basics (understanding app developers and how to work with them to get the most out of the relationship), creating a value proposition, defining app functionalities that should be part of the app, setting priorities and understanding the MVP (minimum viable product), and how to wireframe the mobile app concept. “We want to demystify the mobile development process and help businesses understand the initial steps they can take to feel confident in talking to a technology partner,” said Kujava. The event runs from 7:30am – 1:00pm at 2675 Bellingham Drive in Troy, MI 48083, and the $50 registration fee covers all materials, a continental breakfast, and a snack. Attendees are asked to bring their own laptops. Register at http://dld.bz/dT4g7. Registration is limited to 40. “How to Build a Successful Mobile App Bootcamp” is sponsored by Michigan Small Business Development Center, Mobile Technology Association of Michigan (MTAM), Automation Alley, and Logic Solutions.